This circuit was designed on request: i.e. a bulb that gradually turns on (1 sec. period), stays on for 1-2 sec. and then gradually turns off in about the same lapse of time. Due to the high current involved (almost 5A for a 55W bulb) a PWM circuit was devised, in order to drive efficiently the MosFet output device. One of the two op amps contained into IC2 compares two different triangular waves present at its inputs and generates a Pulse Width Modulated rectangular wave. At pin #2 of this IC a 110Hz triangular wave is present, obtained from a square wave oscillator formed by IC1A, R3 and C3 and followed by the integration network R4-C4. A single cycle triangular wave with a period of about 6 sec is present at pin #3 of the same IC and is generated by pushing on P1. C1 and R1 set the delay of the first half-period, i.e. the delay during which the output pin (#10) of IC1C will be high. During this half period of about 3 sec. C2 charges through R2 and then, when pin #10 goes low, discharges in about the same lapse of time. 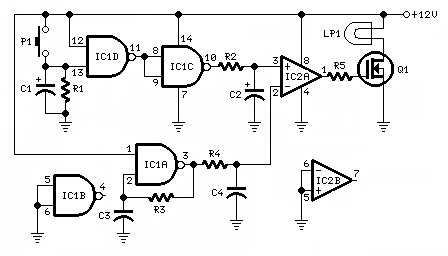 Please note that a gate of IC1 and an op amp of IC2 are not used. Therefore, their inputs must be tied to negative ground, whereas the outputs will be left open. R4 value can be adjusted to set the best fade-in fade-out effect. Its value should lie in the 47K - 100K range. It can be also conveniently substituted by a 100K trimmer. R5 value should be comprised in the 100 Ohm - 1K range. Its precise value is depending by the MosFet type used.